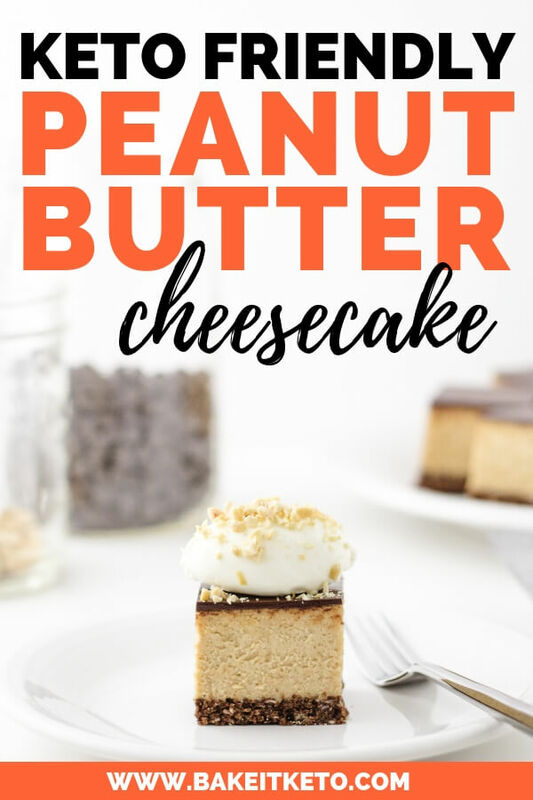 You will not believe this creamy Keto Peanut Butter Cheesecake recipe is low carb! It’s EXTRA peanut buttery, with a chocolate crust and chocolate ganache topping. 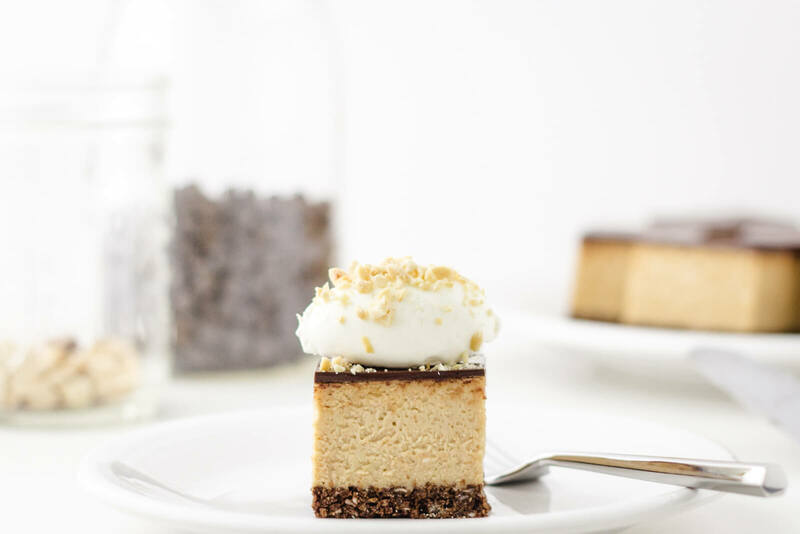 Oh man, this Keto Peanut Butter Cheesecake recipe is one to hold onto! When someone gets started on keto, one of their first questions is usually “What desserts have no carbs?”. Because let’s face it, for a lot of us, low carb treats make it possible to actually stick to a keto diet without feeling deprived. But if you’re new to keto and low carb baking, you’ve probably also realized that some of the special ingredients you need are pricier than a typical bag of flour or sugar. And you really don’t want to waste them on a dessert that’s just mediocre! What Is The Best Low Carb Dessert? So what’s the BEST low carb dessert to make? You can’t go wrong with this Keto Peanut Butter Cheesecake! Why is that? First, peanut butter and chocolate are obviously a universally loved combination, so whether you’re making the cheesecake for yourself or to share, you’re sure to win over any keto skeptics. Second, there’s absolutely nothing finicky about this cheesecake recipe. It’s super easy to make, even for a beginner. You don’t even need to cook it in a water bath! And while you could bake it in a classic round springform pan, I think cheesecake bars are much easier to cut (bonus – they look cute too!). 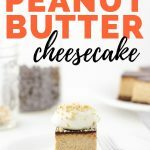 How Do You Make Keto Peanut Butter Cheesecake? This recipe has three parts but don’t let that scare you off! Each layer is simple and doesn’t require much hands-on time. The first step is to make the chocolate crust. Most keto and low carb cheesecake recipes use an almond flour based crust. But since I’m sensitive to almonds, I prefer using a tree nut free cheesecake crust. I originally created my pork rind based crust recipe for my Keto Eggnog Latte Cheesecake Bars. I loved it SO much that I’m continuing to adapt the crust recipe for every new cheesecake flavor I make! So for this Keto Peanut Butter Cheesecake Recipe, you’ll be making a chocolate version. My pork rind based keto cheesecake crust is just as easy to make as any high carb cheesecake crust. Just pulse the pork rinds, flaked coconut, Swerve, cocoa powder, and cinnamon in the bowl of a food processor until you get the consistency of coarse crumbs. Then pour in the melted butter and pulse the mixture again to coat every crumb in buttery goodness. Press the pork rind crust into your prepared pan and bake for 8-10 minutes, just like you would with a traditional carb-filled crust! My keto cheesecake crust recipe uses exactly one 2.5 oz bag of Epic’s Himalayan Pink Salt Over Baked Pork Rinds. I buy this 4-Pack on Amazon since it’s more cost effective than my local grocery store. Cheesecake is the perfect dessert to turn keto because it doesn’t require a lot of fussing around with different low carb flours. In this recipe, you’ll cream together the cream cheese and Swerve sweeteners. Once the cream cheese and Swerve are super soft and fluffy, it’s time to add the peanut butter and salt (if your peanut butter is unsalted). If your cream cheese is too cold and stiff it won’t blend well with the peanut butter and you may end up with lumps. It’s a good idea to stop the mixer occasionally and scrape the bowl down with a rubber spatula. Make sure to get the bottom center, where the paddle can’t quite reach! Next, it’s time to add the room temperature eggs, one at a time. I warm the eggs quickly by letting them sit (still in their shells) in a mason jar full of hot water for a few minutes. Using room temperature eggs and adding them one at a time simply allows the fats and liquids to emulsify, resulting in a smooth and creamy mixture. Similarly, it’s a good idea to add the heavy cream gradually. And of course, don’t forget to scrape the bowl with your rubber spatula again! Scrape the cheesecake filling into the prepared pan and spread the filling evenly. This is a thick filling because of the peanut butter, so I used an offset spatula for this but you could just tap the pan on the counter and gently tip it in each direction. No need to worry about a water bath! This low carb peanut butter cheesecake recipe will need to bake for about 30 minutes at 325 degrees F. I recommend setting the timer for every 10 minutes, so you can rotate the pan in the oven and check it’s progress. You will want to remove the cheesecake from the oven once the filling has just set in the middle. If you gently shake the pan, the cheesecake filling should jiggle as one. Since we’re going to be coating the top of this keto peanut butter cheesecake with chocolate ganache, you could also use a probe thermometer to check the internal temperature of the filling, and no one will ever see the hole the thermometer leaves. Once the filling has reached about 150 degrees F, you’ll know it’s ready to pull out of the oven! Making ganache is a great skill to learn. Not only does it add that extra impressive pizzaz to a dessert, but it’s also SO easy to make, and SO forgiving. Simply heat your heavy cream to a simmer and then pour it over the chocolate in a heatproof bowl. The heat from the cream melts the bits of chocolate within a few minutes. When you whisk them together, they form a delicious sauce that will become firmer as it cools. Pour the ganache over the cheesecake and use an offset spatula to spread it into a thin, even layer. In this recipe, you’ll be using Lily’s Sugar Free Chocolate Chips. I also buy these in a 4-Pack on Amazon because it’s much less expensive than at my local grocery store. You could also use a Lily’s Sugar Free Chocolate Bar or even some unsweetened baking chocolate – just be sure to finely chop the chocolate so the cream can melt it easily. Did your ganache cool before you were able to thoroughly mix it together? This recipe only requires a small amount of ganache, so it won’t hold the heat for too long. Just gently heat the ganache bowl gently over a double boiler, or in the microwave for no more than 10 seconds at a time (if your bowl is microwave safe). Then whisk it again until the ganache comes together. I always let my cheesecakes cool for around 60 minutes before I put them in the fridge. Putting something super hot directly in the fridge can bring up the overall temperature of your fridge and potentially affect the temperature and safety of other food in the fridge. After the Keto Peanut Butter Cheesecake has cooled for around 60 minutes, I transfer it to the fridge to chill. Allow the cheesecake to chill for at least an hour, overnight is possible. The colder the better, but I have definitely cut into mine after just an hour before. No judgment here! I don’t typically worry about my cheesecakes cracking. As long as you use a good non-stick pan and don’t overbake the cheesecake you shouldn’t have a problem (again, an internal temperature around 150 degrees F is usually good). But even if your peanut butter cheesecake does crack, not to worry because it will be covered by the chocolate ganache topping! 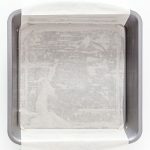 Grease an 8-inch square baking pan and line with a strip of parchment. In the bowl of a food processor, combine pork rinds, flaked coconut, Swerve, cocoa powder, and cinnamon. Pulse until the mixture is the texture of coarse crumbs. Press the crust firmly into the prepared pan. I used a second pan of the same size to press it down. Bake at 375 degrees F for 8-10 minutes, or just until the crust becomes fragrant and starts to darken around the edges. Set the crust aside to cool while you make the filling. In the bowl of a stand mixer fitted with a paddle attachment, cream together the softened cream cheese, granulated Swerve, and brown Swerve. Add the peanut butter and salt (if using) and continue to mix until smooth and creamy. One at a time mix in the eggs, then gradually pour in the heavy cream, followed by the vanilla. The peanut butter makes this filling especially thick, so use a rubber spatula to scrape the bowl down thoroughly with each addition. Scrape the cheesecake filling into the prepared crust. Gently tap the pan on the counter to spread the filling evenly or use an offset spatula. Bake at 325 degrees F for 30 minutes, or until the filling is just set in the center. Set the cheesecake aside to start cooling while you make the ganache topping. Add the Lily's sugar free chocolate chips to a medium, heatproof bowl. Heat the heavy cream to a simmer and then pour it over the chocolate chips in the bowl. Allow to sit for 3-5 minutes, undisturbed, so the cream can melt the chocolate. Whisk the chocolate and cream until the mixture comes together to form a smooth ganache. If your ganache has cooled too much, gently reheat the bowl over a double boiler or in the microwave (in a microwave safe bowl, no more than 10 seconds at a time). Pour the warm ganache over the cheesecake, using an offset spatula to evenly spread it in a thin layer. Once the cheesecake has been cooling for a total of 60 minutes, transfer it to the refrigerator to chill for at least 60 minutes (preferably overnight). Use the parchment to pop the chocolate peanut butter cheesecake bars out of the pan and transfer them to a cutting board. If the bars are stuck, just dip the bottom of the cheesecake pan in a larger pan of hot water for a minute to gently warm the outermost layer of fat. The bars will slide right out of the pan! Cut the cheesecake into 16 bars. For the cleanest cuts, I use a granton blade slicing knife. I dip the knife in a dish of hot water and quickly dry it with a paper towel before making a cut. Then repeat. WANT TO SAVE THIS KETO PEANUT BUTTER CHEESECAKE FOR LATER? CLICK HERE TO SAVE THIS RECIPE TO YOUR FAVORITE KETO PINTEREST BOARD!